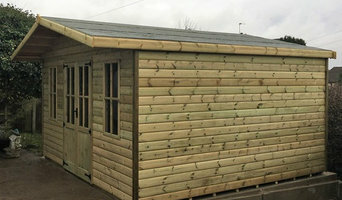 At S&E Timber Supplies Ltd, we provide high-quality timber products and custom-made garden buildings and accessories. 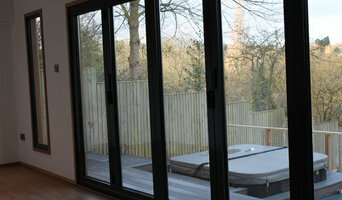 From internal and external doors to garden furniture, sleepers and decking. We supply timber to both Trade and Public at affordable prices. Crusoe Garden Rooms are handcrafted Western Red cedar-clad timber framed buildings and can be designed and built to YOUR requirements. Fully insulated, internally boarded and plastered, including a full electrics package, our garden rooms makes an ideal extension to your home. Cool in the summer and warm in the winter the Crusoe garden building can be used all year round. Our garden rooms include multipoint locking aluminium or UPVC doors and windows in a range of styles and colours, along with a one piece rubber roof, and are clad on all sides in Western Red Cedar - giving a complete quality finish to your garden building. 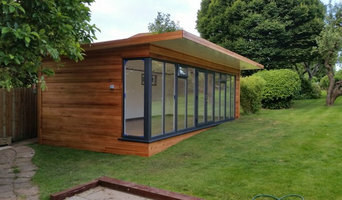 Affordable, highly insulated, double glazed, bespoke garden offices, all year use, manufacturer of quality garden offices. We are pretty sure you may be tired of maintaining your old wooden deck. Maybe the colour has faded over time? Even worse, has the material started to perish? Well here at Deck Mate UK, we think we have the perfect product to transform your garden. We supply and install UPM ProFi Composite Decking throughout West Yorkshire and East Midlands. This fantastic product will ensure you have more time to enjoy your deck and less time maintaining it. For a chat about composite and the benefits of switching, please get in touch with one of our team. Fiberon Decking UK are leading providers and installers of high quality, durable composite decking solutions. With recycling being a huge aspect of our everyday lives, Fiberon Decking engineer their composite material from recycle domestic Maple wood by-product, which is recovered from flooring and furniture, combined with recycled plastic. Your chosen specialist will run through your options based on your available budget and space, and discuss potential stumbling blocks such as building regulations and planning approval. A shed is typically counted as a temporary structure but every planning authority will vary in its requirements and Derby, Derbyshire shed builders can help work through this with you. Many summerhouses on the other hand will warrant planning permission due to their size and more permanent nature. When it comes to patio installation, or decking installation in Derby, Derbyshire, you will certainly find working with Derby, Derbyshire decking installers and patio pavers will lighten the workload and ensure your new garden feature offers a great outdoor space for years to come! You may also want to work with a garden design professional to plan your garden space before engaging a patio or decking installation professional in Derby, Derbyshire. This decision may in the end come down to the space you have available for your garden room. Today, there are many specialist Derby, Derbyshire shed builders that offer high quality sheds in attractive and colourful designs that can easily be transformed into compact outdoor rooms. At its simplest construction, a garden shed is obviously a very useful storage place, whilst a summerhouse typically works as a real garden showpiece, there as a garden room to be enjoyed come rain or shine. And it can be constructed in almost any style you wish. How about a traditional log cabin or something more contemporary such as an energy-efficient modular design or a Scandinavian summerhouse of interlocking construction? Customise your summerhouse with lighting, heating and even internet connectivity depending on the core use, whether that’s a separate workspace, home gym or sun-bathed hideaway. A summerhouse can look overbearing if it’s more than a quarter of the total size of your garden so, again, check with your specialist to see how big is too big. Patios are a great place to entertain friends and family over a juicy barbecue and bottle of wine on a balmy summer’s evening. A patio looks particularly good at the front of a large garden, teamed with cast iron patio furniture, and can be constructed from a number of different materials such as stone, brick and concrete. Your Derby, Derbyshire patio designer or patio installation specialist will be able to plan an attractive patio design which can range from a simple regular tiled layout to complex mosaic patterns. Alternatively, hardwood decking is another great way to bridge indoor and outdoor areas, separated by sliding or French doors. If your garden is lower than your home, consider asking your decking installation professionals in Derby, Derbyshire to raise the deck to the level of the floor so you can step seamlessly outside. And it needn’t be a standard rectangular decking installation either. Go with the flow and add a curved border, accentuated by decking lights. If the kids are making you climb the walls, ask your expert to help you design a low-level play area, painted in bright colours and incorporating a sand pit. No kids? A gazebo or pergola will go well with that timber decking installation – the perfect spot for reading or snoozing. Search in the Find a Pro section of the website for Derby, Derbyshire patio and decking installers as well as shed builders and summerhouse manufacturers. 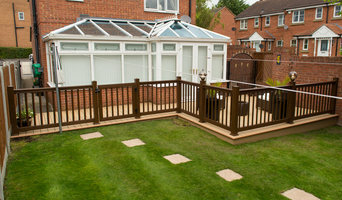 You can also look through Derby, Derbyshire photos to find examples of decks and patios that you like, then contact the decking installation professionals in Derby, Derbyshire who worked on them. Or look for photos of summerhouses or sheds that are tagged with the suppliers information.